I'm finding myself very disappointed with this book. It is very dis-jointed, the writing doesn't seem to flow. She jumps from one character situation to the next very quickly. The characters interaction with each other seems very formal and reminds me of bad acting in movies. It is very difficult to pick the book back up again. I'm going to try and get through it, but I wouldn't recommend it. ug. I agree with some of the other comments. The writing is disjointed. She seems to jump around in the thoughts of her characters. In one sentence they have one feeling. In the next it's the opposite feeling. I had no trouble putting down this book which is a bad sign for a book. I only made it to page 40 or so on this book. It just couldn't keep my attention. The whole werewolf killing a person 150 years ago and then their decedents coming together in present day sounded like a good idea, but just wasn't executed enough to keep me interested. This one just wasn't for me. A plesant read, I had heard a fair few bad reviews for this book, so was impressed when it read well, the plot was good and the finale too. PIck up Prey the second book in the series. Too many romances, not enough book length to do any of them justice. 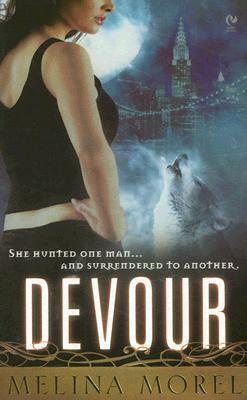 Melina Morel - Melina is from New Jersey and spent many years teaching before publishing her first paranormal novel, DEVOUR. She always loved history and enjoys reading it, especially relating to the world’s great empires. She’s a big fan of the History Channel and has always adored costume dramas. Her love of history also led to an appreciation of art and fashion, and in fact, she put this to good use when she wrote two historical novels under another name some years ago. Delving into world myths and folklore led to an interest in the theme of the werewolf and the vampire, which seem to be quite widespread around the globe.